The Key West Aquarium is the island’s oldest attraction and one of our favorites. It was built by the WPA during the Depression to help make Key West a tourist destination. It is the first point of interest we point out as our tours depart from Mallory Square. One of the things that makes the place so special is that it is filled with locals. All of the critters at the Aquarium are from the Florida Keys. The tarpon, the lobster, the seahorses, the stingrays and the sharks, are the same tarpon, lobster, seahorses, stingrays and sharks you would meet diving or snorkling. If you haven’t been to the Aquarium in while, go. It’s a real Key West treasure. And don’t forget if you are a resident of Monroe County, the first Sunday each month is free to locals. Go meet the Moon Jellies! Posted in St. Augustine | Comments Off on Celebrate Good Times! Posted in Washington DC | Comments Off on What’s in a name? 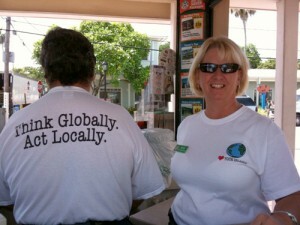 People come from all over the world to see Key West. Its beautiful sunsets, blue waters, beautiful architecture are all part of the charming little city we call home. Because showing off the Southernmost City is how we make our livings, it is important to all of us at the Old Town Trolley Tours of Key West to make sure it looks its best. For us it goes beyond recycling. which we do, running our vehicles on clean burning propane, which we also do, and thinking about how our decisions will impact this planet, which we do. There is a program on in Key West called Love Your Island, which was started by our CEO, Chris Belland. This group helps educate folks about recycling, buying organic and going green. 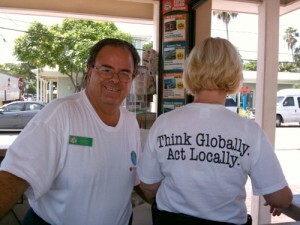 Their mission is to remind us to Think Globally, Act Locally. On the seventh day of each month, our CASTmembers wear their Love Your Island t shirts to remind us, our guests and the residents of this little island that the earth is one big island and we all need to do our part in protecting it. Make sure wherever you live, to Love Your Island like we love ours. It must be the seventh day of the month! Posted in Key West | Comments Off on On the Seventh Day…. 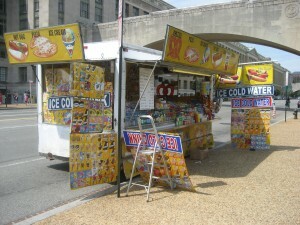 All throughout DC, there are numerous places to eat. Fast food restaurants line the major streets, while full service restaurants are opened and closed on pretty much a daily basis. Open any official Washington, DC guidebook, you will find at least a listing of restaurants if not a review of places to eat all throughout the city. From B. Smith’s at Union Station to Potbelly’s on 11th Street, NW, food is rampant in the nation’s capital. And if you can name a restaurant, most likely, it has been reviewed. All except for one major exception—the hot dog cart. You are currently browsing the Old Town Trolley Tours Blog blog archives for August, 2009.